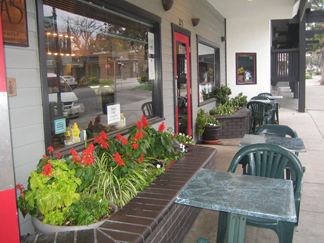 42nd Street Bagel Café is a family owned restaurant centrally located in the heart of the Claremont Village. Many small groups of people can be found here daily visiting over a cup of coffee and enjoying a freshly made meal and friendly, casual atmosphere. Our menu includes 27 different bagel varieties baked fresh throughout the day. Nothing is better than a warm bagel right out of the oven with your choice of 11 different whipped cream cheeses. Patrons enjoy our many blends and FREE REFILLS of Gaviña Gourmet Coffee where a new flavor is featured daily at our coffee bar. All flavors can also be purchased in bulk by the pound or 1/2 pound and enjoyed later at home. In addition to our bagel selection, we also serve other breakfast items as well as sandwiches, melts, salads, and homemade soups. Daily Lunch Specials are offered on your choice of bagel and are served with a side order, drink, and cookie. Be sure to check out our menu items, coffee specials, and catering menu. We look forward to feeding you in the future. Where "Great Taste" and "Good For You" come together!